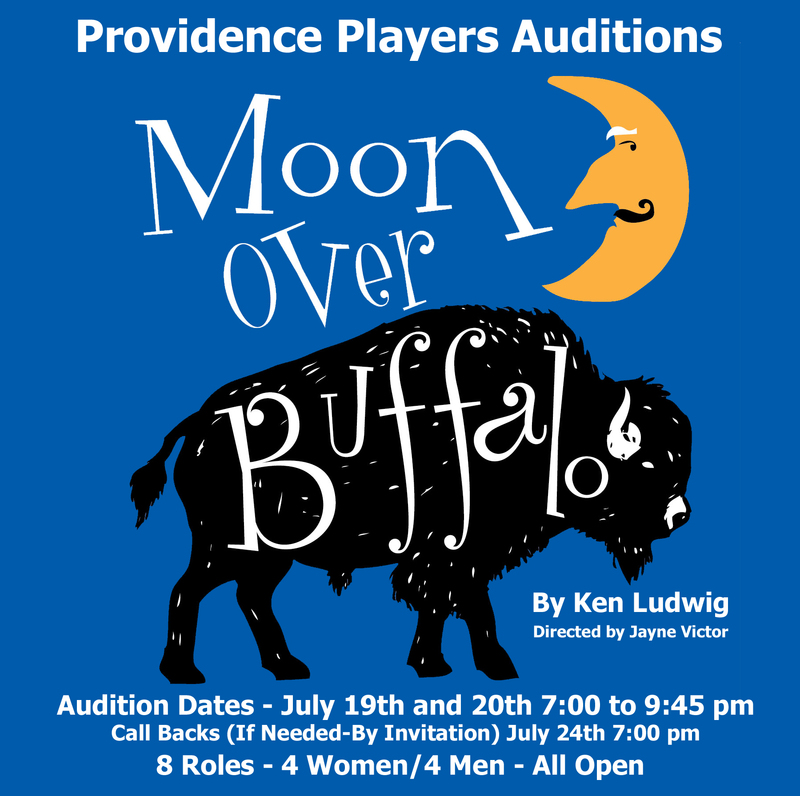 The Providence Players will be holding auditions for our production of Ken Ludwig’s outrageously funny farce, Moon Over Buffalo, on July 19th and 20th at the James Lee Community Center located at 2855 Annandale Rd in Falls Church. There are 8 roles and all are open. The Providence Players is a twenty-year-old, award-winning, non-profit community theater troupe. 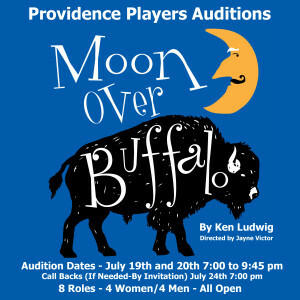 Moon Over Buffalo is the opening production of the Providence Players 20th Anniversary season. An RSVP is necessary for planning purposes only. We do NOT require or make audition reservations or time slot appointments. Plan on attending as much of the audition session as you are able. We have fun at auditions and you will be up and down multiple times in different scenes and with different audition partners. No monologue is required. Read on for further information. From the master of period-perfect farce, Ken Ludwig, this fast-paced comedy, set in the Erlanger Theatre in Buffalo in 1953, Charlotte and George Hay are on tour with a repertory consisting of Cyrano de Bergerac and Noel Coward’s Private Lives, when they receive word that they might just have one last shot at stardom: Frank Capra is coming to town to see their matinee. Mistaken identities, outrageous plot twists, slapstick comedy and a slew of self-obsessed performers desperately try to keep things from (hilariously) falling apart. Auditions will be held in the Arts and Crafts Room and Urbanites Rooms – NOT IN THE THEATER. Both the Arts and Crafts Room and The Urbanites Room are located to the left of the main desk at the front entrance of the community center. Signs will be posted.  PLEASE RSVP to the director at jaynevictor@verizon.net with the date you plan on auditioning.  HOW WE WORK: We do not use a system of audition time slots or appointments. You are welcome to come to auditions on either (but not both) of the initial audition evenings. No appointment is necessary but please come as close to the start of auditions and plan on staying until the end. PPF auditions have actors up and down to read multiple times in multiple combinations and scenes. Most actors find this fun. As space allows, you will be able to watch all the auditions. You may be asked to go into the hallway with audition partners and work a bit on a scene. We will do our best to get you up multiple times reading for parts you are interested in. You may also be asked to read for other parts you may not be auditioning for. The Providence Players strives to make our productions open to interested and engaged actors & actresses, regardless of their level of experience. We try and make our auditions as relaxing and fun as possible.  AUDITION PROCESS: Auditions will consist of readings from the script – No monologue is required.  AUDITION SIDES: Sides for the audition process will be supplied at auditions.  AUDITION FORM: Resumes and headshots will be accepted, but are not required. Please ALSO COMPLETE the attached PPF Moon Over Buffalo Audition Form and bring it with you to the audition.  MEMBERSHIP: The Providence Players of Fairfax is a membership organization. Membership is not required to audition. If cast, actors in addition to production team members will be asked to become members of the Providence Players ($10) for the season (if they are not already).  RSVP: Please RSVP if you plan to audition to the director at jaynevictor@verizon.net (or email her any questions you may have). A copy of the preliminary production schedule is included with this announcement. Stage rehearsals begin September 5. 2017. The Director will be mindful of actor’s time and will do the best to schedule rehearsals in blocks initially. Additional full cast readings of the play and some selected scene study and character work may be scheduled based on actor availability in August. The schedule for these will be finalized after casting. Unless indicated otherwise, all rehearsals will happen at the James Lee Community Center. Rehearsals will be held in the evenings roughly from 6:45 to 9:45 pm and on Saturdays and Sundays as indicated. Moon is a madcap comedy about Charlotte and George Hay who are fading actors with their own acting troupe who are currently performing Private Lives and Cyrano de Bergerac in repertory at The Erlanger Theatre in Buffalo, NY in 1953. Charlotte has great dreams of still making it as a big Hollywood film star, her husband George is very satisfied as a stage actor which he sees as superior to film. Charlotte and George having no other offers head to Buffalo with a cast of characters to perform, and a series of events create a hilarious 2 act play. The action and dialogue are very fast paced and many of the roles require physical comedy. • George Hay (Male 50’s) a traveling actor who along with his wife Charlotte runs the theatre company. Strong physical comedy including stage combat. • Ethel (Female 60’s/70’s) Charlottes mother. Grumpy, trouble maker, very hard of hearing. Her son-in-law makes her crazy. • Rosalind Hay (Female 20’s/30’s) Charlotte and George’s daughter. Used to act in her parents acting troupe, but decided to leave for a “real career”. • Eileen (Female 20’s/early 30’s) Aspiring actress, eager to please. Has a crush on George; they have been having a fling. • Howard (Male late 20’s/early30’s) a TV weatherman and Rosalind’s fiancé. Comes across as a wimp, annoying and nervous. Physical comedy. • Paul (Male 30’s/early 40’s) actor and stage manager of the acting troupe. Used to be Rosalind’s boyfriend and wants her back. He would not leave acting for Rosalind. Physical Comedy. • Richard (Male late 40’s/50’s) The Hay’s attorney who is in love with Charlotte and always tries to convince her to leave George. Jayne’s resume includes work on stage and behind the scenes. She began directing children’s theatre in the late 70’s and directed in college in the 80’s. This will be Jayne’s 3rd turn at directing for PPF having directed Auntie Mame and Glass Mendacity. Most recently Jayne was seen as Sonia in Vanya and Sonia and Masha and Spike at PPF.